The Fed reported on Friday that Industrial Production declined by 0.1% in January on a seasonally adjusted basis, after rising in December by 0.4 per cent. The consensus estimate was for an increase of 0.2%, so it was a miss. The actual, not seasonally adjusted number rose by 0.6% month to month and was up 2.4% year to year, the same as in December. The growth rate slowed in 2012 versus the first 2 years after the economy bottomed, but it has been stable for the past year. Changes in January versus December have varied widely over the past 10 years. There’s no seasonal pattern evident, therefore no reason to apply a seasonal adjustment (Why I don’t use seasonally adjusted (SA) data). In 2012 January was also up 0.6% and in 2011 it was up 0.3%. The only years better than this year over the past 10 years were in bungee rebound years from the pits of recession in 2010 and 2003. The average January change over the past 10 years was virtually unchanged at less than -0.1%. Stock prices had been heading toward an overbought level relative to industrial projection in 2010-11 but that stopped in 2011. The ratio of the S&P 500 to the Industrial Production Index turned flat in response to the Fed holding the SOMA flat from mid 2011 until November 2012 when the Fed’s QE3 MBS purchases began to settle. It added Treasury purchases to that in January (which I refer to as QE4). Those purchases are reflected in the green line on the chart moving up. That will continue for as long as QE3 and 4 continue. I would expect industrial production to tag along. 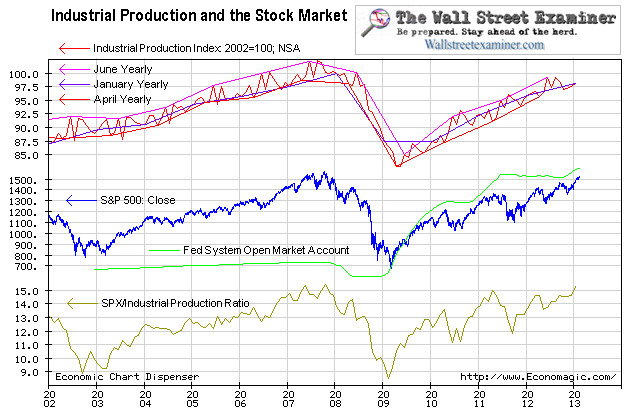 Stocks are apparently becoming expensive relative to industrial production. After holding flat for most of 2012, the SPX/Industrial Production Index ratio began to rise again in January, almost reaching the 2007 highs in this measure. That doesn’t necessarily mean that “the end is nigh” for the bull market. 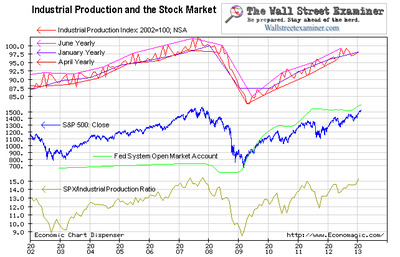 If industrial production expands faster as QE3 and 4 cash trickles down through the economy, the rise in stock prices can continue for a while. In 2007 when this indicator was peaking along with the stock market, the Fed had already pulled the plug on growing the SOMA. That’s what ended the bull market, not the fact that stocks were extended. I would expect something similar to end this bull move. The SPX now in excess of 15 times the industrial production index is certainly a yellow flag. It gives some reason, other than just some jawboning by more hawkish Fedheads, to be on the alert for a move by the Fed to slow the growth of its balance sheet this year. That would put an end to the bull market. This post is derived from the permanent Industrial Production and Electric Power Generation chart page. Get the full story on the technical outlook for stocks daily with a 30 day risk free trial to the Professional Edition Daily Market update.